People die. This isn’t any revelation, but the way we find out about someone’s death has certainly changed over the years. It used to be that we read Obituaries in our local papers about someone’s passing. If that someone was a celebrity, we would hear about it on the radio or even see it on television – sometimes breaking news would take us away from whatever program we were watching or song we were listening to on the radio. Those were the old ways. How different have things become in a seemingly always connected (Internet) society? We not only receive the news, but often we participate with it. Some of us even are responsible for the news or have the “power” to publish a response or our thoughts about those events. Can you recall the first time you heard someone say, “I can remember where I was when ________ happened or _____________ was killed.” The tragedies of 9/11 brought this to an all too realistic, real-time presence. And, arguably, so did the iconic death of Michael Jackson on 6/25. 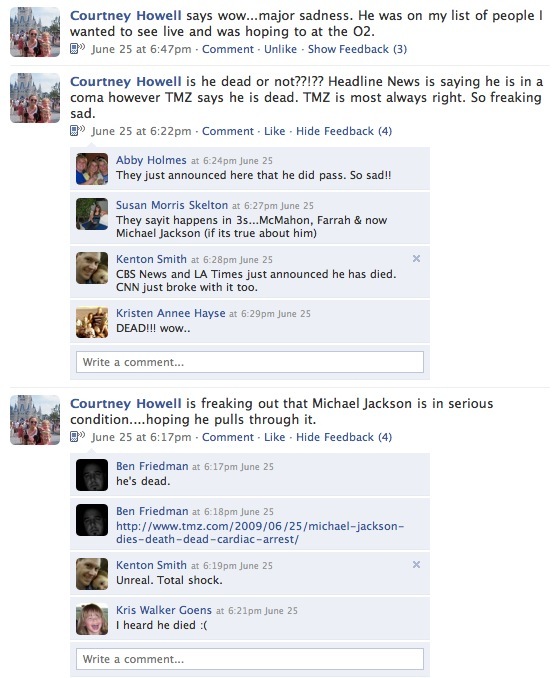 How did you learn of Michael Jackson’s death? Did you hear about it? Read about it? Did you text about it? Did you have an online dialogue about it? Did you have a near real-time “experience” online with others through a blog or social networking site? “The live web” or “we the media” – “a world in which ‘the former audience’ not a few people in a back room decides what’s important” (Lankshear & Knobel, 85). Permalinks = the device that turned weblogs from an ease-of-publishing phenomenon into a conversational mess of overlapping communities (Lankshear & Knobel, 85). How have social networking sites fixed this problem? Solved others? Shaped the way we receive and/or participate with information? 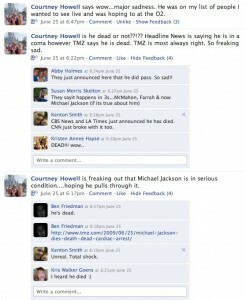 Mashable.com reported that tributes to, and remarks upon, Michael Jackson’s death were responsible for 30 percent of tweets.